McCutcheon also did a bit of surveillance of Dennis Oland in the days and weeks following the murder and was involved in retrieving some “cast off” evidence. The earlier trial heard that police surreptitiously obtained DNA evidence from Richard Oland’s accountant and his brother from “cast off” implements they used at local restaurants. None wearing protective gear, says McCutcheon. Paris quickly located the receipt, he says. McCutcheon is displaying an incredible memory - recounting names and dates and events from 2011 with no apparent reference to notes. Defence lawyer Michael Lacy handling cross-examination. Asks McCutcheon about July 10, when he was at the scene 12hrs 23 min. You didn’t get relieved at all? That’s correct. Normal bodily functions? McCutcheon reveals that he used the washroom in the foyer outside the office. 1st trial in 2015 heard the washroom was used by officers for two days before it was tested for forensic evidence. He recalls smaller steps that came off the side of the concrete “porch” with a drop off from the concrete to the ground in the spot the stairs are now. McCutcheon says he understood the washroom was outside the crime scene. He didn't believe he'd be compromising the crime scene by using it, he says. 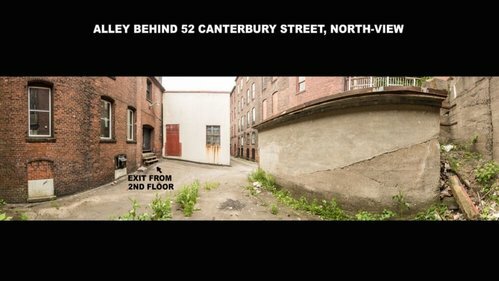 In the first trial much was made of lead investigator Stephen Davidson saying he recalled jumping down off the landing into the alley - something defence lawyers portrayed as impossible given the configuration of the stairs. They used it to question Davidson’s truthfulness. But McCutcheon’s recollection of different stairs suggests that jumping into the alleyway might have been possible. Defence lawyer Michael Lacy questions the accuracy of McCutcheon’s recollection after seven years. McCutcheon says the current photo he’s looking at just looks different than what he remembers. McCutcheon also acknowledges using the washroom next to Oland’s office on one of his 12 hour long guard shifts. He said he thought it was outside the scene being investigated and no one instructed him otherwise. He had been on the force just 7 months at the time. Forensic specialist Sgt Mark Smith had not yet checked the washroom as a possible cleanup area for a killer and didn’t realize officers were making use of the area. Oland trial resumes. Defence lawyer Michael continues to question Const. Chris McCutcheon. Asks how many times he used the washroom in the foyer on July 10. Twice. Did you wash your hands? Yes. With water and soap? He can't recall if there was soap, but if there was, he would have used it, he says. McCutcheon currently works for the major crime unit, court hears. In 2011, he had only been a constable for 7 months. "You would have relied on guidance from other officers, is that fair?" asks Lacy. "That is fair," says McCutcheon. If someone had told you not to use the washroom, you obviously would have abided by that? "That is correct." Const. George Prosser on the stand. Being questioned by Crown prosecutor P.J. Veniot. Prosser provided scene security on July 9, 2011, starting at 6:35 a.m.
Prosser reveals he too used the washroom in the foyer outside the bloody office. He was at the scene for more than 12 hours. He says Richard Oland's secretary's husband, Bill Adamson, also used the washroom. When Bill Adamson used the washroom, you had no instructions otherwise? Prosser says he believes he asked forensic Sgt. Mark Smith if it was OK for Adamson to use the washroom because he wouldn't have allowed "just anybody" to use it. Lacy asks if Prosser if prosecutors regularly attend serious crime scenes. He says he's not sure. Lacy suggests it's highly unusual. Prosser also noted Insp. Glen McCloskey was in the inner office from 12:28 pm. - 2:08 p.m., while Smith was processing the scene. Dennis Oland was being interviewed by police at that time and had mentioned he had stopped at the wharf on his way home from visiting his father the night before. He found a 3-foot piece of rusty rebar in a garbage can. It didn't have any blood or hair on it, but he seized it, he says. Didn't find anything else. Dennis #Oland murder retrial is done for the day. Scheduled to resume Tues at 9:30 a.m.